We have a few observations on what all went down last week and wanted to share them — better late than never! Really is quite striking how the optimism surrounding #Bucks & their future has flourished since Lasry & Edens came on the scene. Obviously new owners, GM’s or coaches in any sport get a honeymoon period and Edens and Lasry are no exception. But there was something different about last week. Something that become very evident as the new owners public relations tour was occuring. It was the fact that someone with significant power within the Bucks organization was out beating the drums about the team. The last time the Bucks had something like this was George Karl over a decade ago, as Karl was able to regale and excite the local media and citizenry with his charisma (and winning track record imported from Seattle). This is not a slight against Senator Kohl. He’s always been quiet and reserved in a hard-working Milwaukee type of way. And for Kohl, his actions can speak louder than words as they did with his structuring of the team sale, requiring the franchise remain in Milwaukee while pledging $100 million towards a new arena (more on that below.) That said, the Bucks have been desperately missing a public leader for years, whether that role was filled by the owner, GM or coach. It was very evident last week how much that component was missed. In a matter of 48-hours, Edens and Lasry have gotten the core fan base fired up while beginning the long process of bringing the casual fans back. Further, Edens and Lasry did not play favorites. They went to virtually every single media outlet in town, rather than perhaps try to lay back and only give exclusives to Bucks broadcast flagship station, 620 WTMJ, as the Bucks might have done in years past. Nor did the new owners play favorites with the local sports talk radio stations. They hit WSSP, WAUK, WTMJ and WOKY among others. This was a smart business move to help rebuild and broaden interest in the team. The best asset the Bucks have going right now are the two new owners. Individually and collectively they have a Mark Cuban “success is inevitable” vibe that they need to continue to capitalize on until such time as the product on the court starts to hopefully resume center stage in the coming years. For the past decade, the Bucks had neither the winning nor the coherent plan. And that was the rub with many of the core fans of the team. Overhanging it all was the potential the team might someday be sold and moved. It was a rough era that will hopefully appear further and further in the rear-view mirror as time moves on. 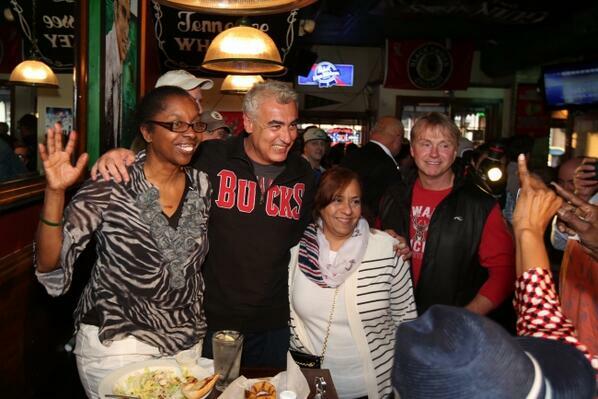 Do we think that Edens and Lasry are guaranteed to lead the Bucks to an NBA championship in the next five-years? No, of course not. The path is even more difficult given that a number of teams are already publicly following the Bucks new model of building through the draft over a period of years. Not everyone is going to be the next “OKC” or “Spurs” as it isn’t statistically possible for every rebuilding team to vault to contending status within three to five years. As a matter of fact, a number of the teams following the long-term rebuild model have and will continue to fail at it. That said, Bucks fans now have a plan, which is critical. The team is going to go young, emphasize draft picks to acquire talent, and will likely only be spending significant free agent money at the time the team is ready to win. This is the type of plan Bucks’ fans have wanted to hear for a long, long time. It is now up to the new owners to execute, which is the hardest part. 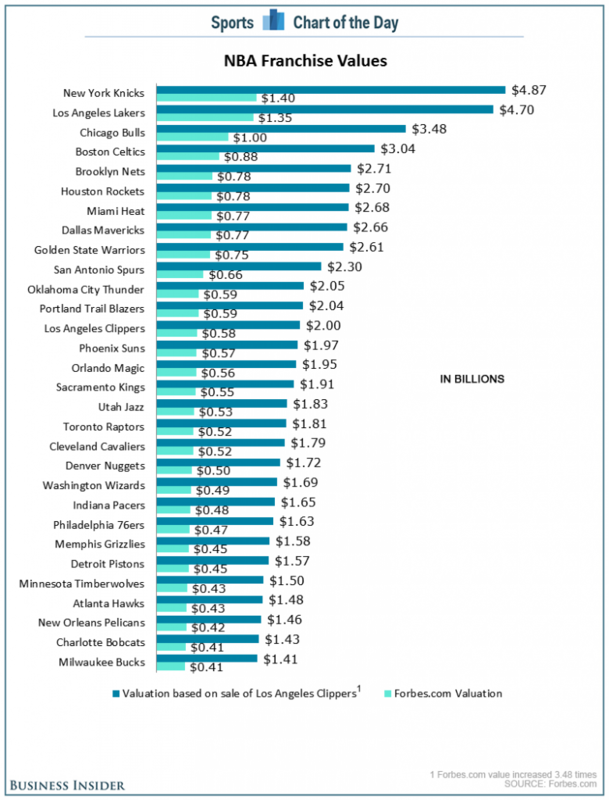 Business Insider posted a piece the other day about how the other 29 NBA franchises might be valued in light of Steve Ballmer’s purchase of the Clippers for $2 billion. They accomplished their calculations (see below) by simply multiplying all team values by 3.48, or the multiple the Clippers actual sale price was from the Forbes team valuations published earlier this year. We’d caution people not to assume that Edens and Lasry made a quick $800+ million last week in franchise appreciation. The Clippers were a unique situation, much like Michael Redd entering the NBA free agent market in 2005. As Bucks fans unfortunately found out, Redd was not worth the 6-year/$90 million dollar contract he garnered from the Bucks that summer. However Redd was the beneficiary of a unique situation whereby the Cleveland Cavaliers felt the need to get a top tier shooting guard to play with LeBron James, and were willing to pay the max to any guard they could get regardless of whether or not the contract made basketball sense (they settled for a 5-year/$70 million dollar contract with Larry Hughes). 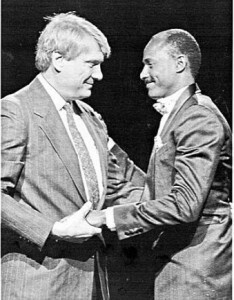 That one special bidder in the form of Cleveland drove both Redd and Hughes valuations beyond what they should have been, and ultimately both franchises paid the price. Ballmer will need to significantly expand the Clippers local revenues for that $2 billion dollar purchase price to ever make sense, at least fiscal sense within the next five to seven years. Obviously Ballmer decided that another team might not come up for sale for a few more years, and he decided to take the plunge, regardless of the cost. Combine Ballmer’s unlimited resources, desire to be an NBA owner, and a viewer-rich Los Angeles television market now up for grabs due to the Lakers imploding, and you can see why the Clippers sold for an irrationally high price, that is likely not 3.48x applicable to a number of other franchises, including the Bucks. The Clippers sale did however again highlight the fact that Ballmer bid hard to purchase the Bucks, with an initial offer of $650 million, before dropping out after being informed by Senator Kohl that a condition of sale would be that the team remain in Milwaukee. We discussed on these pages many months ago the concept that Senator Kohl would be perhaps forgoing $200 to $300 million in sale profit, by requiring buyers to keep the team in Milwaukee. When the original sale price of $550 million was announced, many felt Kohl wasn’t selling at a ‘local’ discount. We believe the Ballmer bid and subsequent Clippers sale price proves that notion incorrect. Who here doesn’t believe that Kohl and investment banker Steve Greenberg couldn’t have pushed Ballmer to a bid of $800+ million had Kohl dictated that would be the price that would grant the new owner the ability to move the team to Seattle? We’ve always tried to walk the fine line at this website of advancing legitimate critiques of how Kohl has run the team the past two decades, while at the same time lauding his commitment to his home town and his Milwaukee Bucks. The Clippers sale last week highlights just how close that meteorite (Seattle and Ballmer) came to destroying Bucks basketball in Milwaukee for good. It was a close call, but Senator Kohl was true to his word, even as it cost him perhaps a few hundred million dollars. The last thing left on his checklist is to assist where needed in getting the new arena built, but his legacy in a new Bucks era is almost secure, and for his forgoing profit to keep the team here we are extremely grateful. Enough of the commentary for this week. Time to get back to focusing on the draft. Wiggins! Parker! Embiid! And we hope Wes Edens and Marc Lasry hit it big on whoever they select!